After the third rollover, you will have the option of further developing your existing products with either a Cost Reduction focus or to improve its Product Specifications. Keep the current product design, continuing to sell last year’s model for another year. Modify your existing product to either reduce Manufacturing Costs and/or improve Product Specifications. Abandon the product, withdrawing it from the market and any existing inventory will be dumped at cost. The Development decision screen is used to make decisions regarding the redevelopment of your existing bike design. 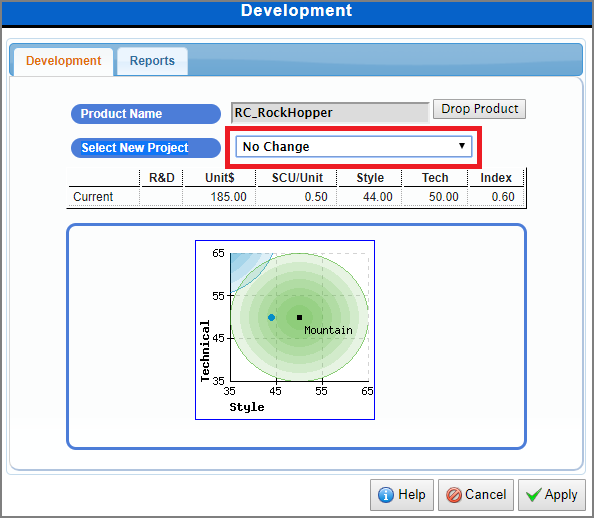 On this screen, you will need to select the New Project Design for your existing bike. There are three new design projects that you can use to develop your existing bike. Developing your existing bike to improve its Product Specification will improve both its Style and Technical Specs. Making this type of improvement will increase your Product Specs index, which is important if you have a Mountain (medium sensitivity) or a Road (high sensitivity) bike. Remember that some markets are very sensitive to product specifications and some are not. The Research and Development cost for this project is $1 million. This project will decrease the Manufacturing Costs per unit produced, which is also known as the Unit Cost. Reducing Manufacturing Costs will increase your Gross Margins (Gross Profit). It is important to note that the Research and Development cost for this project is $1 million, so you must ensure that this project will provide a positive return on your investment in the long run. If we sell the same amount, 20,000 after reducing our manufacturing costs to $133.73 our cost to produce will be $2.674m (20,000 x $133.75). Which will result in an estimated $1m annual savings. This development will improve your products Product Specification Indexes and will reduce the Manufacturing Costs of each unit. However, it is important to note that this project will require a substantial investment of $2 million in research and development costs. Remember that some markets are very sensitive to product specifications, and some are not. Along with this, you must ensure that this project will provide a positive return on your investment in the long run. The Research and Development cost for this project is $2 million.